Commemorate our past, present and future. 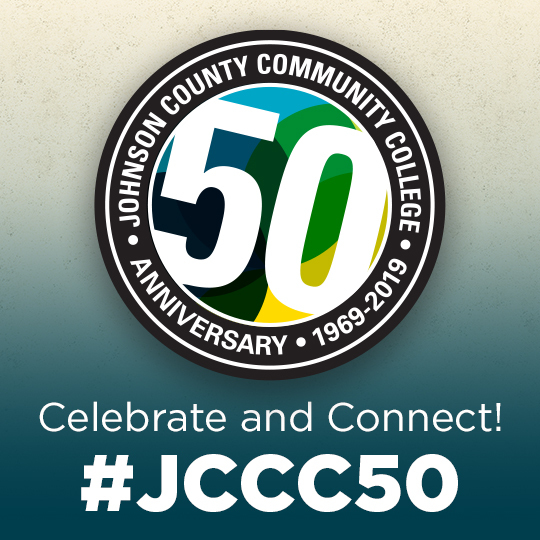 JCCC’s 50th Anniversary inspires and educates our community to connect with the College. While the original campus was being developed and constructed from 1969 to 1972, classes were scattered across Merriam, Kansas, housed in schools, churches and storefronts. In the first fall semester, enrollment peaked at 1,380 students with a growing list of interested individuals. Graduation of the first class in 1971 was held at Glenwood Theatre; 176 students graduated. Meanwhile, sprouting from the farm fields in Johnson County, in the fall of 1972, six buildings emerged and nearly 100 full-time faculty taught more than 3,600 students in credit transfer and career programs. By the end of the 1970s, enrollment had grown to more than 6,300 students. During the 1980s, the 50,000-square-foot Industrial Training Center (ITC) opened and served as the training center for Burlington Northern Railway. The College received a special presidential citation from Vice President George Bush for its partnership with industry. Some Enchanted Evening, the main fundraiser of the JCCC Foundation, began in 1987 to raise the profile of the College and bolster the assets of the Foundation. In the beginning, assets were at $166,000. Today the Foundation awards more than $1 million annually in scholarship support, helping more than 1,000 students every year access higher education. The 1990s welcomed the Carlsen Center, Hiersteiner Child Development Center and the Classroom Laboratory Building. The ITC was expanded and the Welding Lab Building opened. In 1996, the North Central Association of Colleges and Schools again awarded the maximum accreditation of 10 years to the College. Two years later, Rolling Stone magazine named JCCC one of the most respected community colleges in the country. In 1997, West Park Center opened and Continuing Education, Adult Basic Education and English as a Second Language programs began. By the end of the 1990s, enrollment had grown to more than 16,000 students, with full-time students accounting for 53 percent of all credit hours. Johnson County residents made up 74 percent of the student body. By 2000, there was a growing need for a Student Center and a full-service gymnasium. In 2001, the College opened the Johnson County Regional Police Academy and Public Safety Training Center. In 2007, the Regnier Center opened, allowing technology, innovation and entrepreneurship to come together. Alongside the Regnier Center, the Nerman Museum of Contemporary Art holds the largest collection of contemporary art in our four-state region. Olathe Medical Center donated land for the Olathe Health Education Center, which opened for classes in 2011. Curriculum was originally developed by JCCC, Olathe Medical Center, MidAmerica Nazarene University and the Olathe school district. The Wylie Hospitality and Culinary Academy, which opened in 2013, and JCCC Athletics continue to soar. Students in both areas, study and sport, require grit and stamina to stay at the top of their games. State-of-the-art equipment in our specialized kitchens and sports facilities encourage dedication and motivation. Expand the number of direct transfer agreements with universities and colleges in Kansas and the Midwestern region. Focus on sustainability and energy reduction. This has led to a 5 percent drop in kilowatt hours in 2017, with a 30 percent drop in the past nine years, saving the College more the $2.8 million in electricity since 2008 and earning a STARS Silver rating from the Association for the Advancement of Sustainability in Higher Education. Be recognized as a respected and admired community college. JCCC was ranked No. 8 of 868 Best Community Colleges in America and No. 1 as the Best Community College in Kansas by Niche, based on rigorous analysis of data and reviews. The League for Innovation in the Community College awarded membership to JCCC for staying abreast of cutting-edge trends, practices and policies. JCCC is accredited by the Higher Learning Commission. ADT, the security company, ranked JCCC the 7th-safest educational institution in the nation. Excel on the athletic field. Cavalier athletic teams have won 10 national titles since 2000. Acknowledge and exceed the needs of our students and the community by fulfilling our Facilities Master Plan and holding us accountable through our Strategic Plan. Join us as we honor our past and aspire to be stronger in the future.